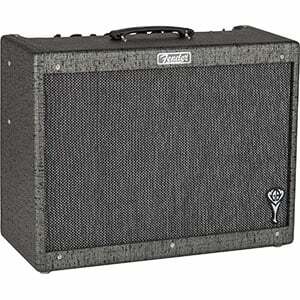 Fender George Benson Hot Rod Deluxe Review – A Jazz Combo with Bags of Soul! While Fender’s Hot Rod Series of amps are a favorite of blues, rock and country guitarists, there’s finally no reason that jazz guitarists should miss out on the fun – thanks in part to jazz great George Benson. The iconic American jazz musician has collaborated with Fender to produce the George Benson Hot Rod Deluxe – a 40-watt combo amp that has been ‘fine-tuned for the world-famous jazz guitar virtuoso’. Let’s take a look at what else George and Fender have in store for us! Looking at the controls, the setup of this amp is typical for all Hot Rods, with everything you need on the top of the amp. These controls comprise two inputs, as well as rotary knobs for volume, bass, treble, middle, drive and master, as well as reverb and presence controls. There’s also a channel selector switch, bright switch and a switch to add ‘more gain’. First off, it’s a stunning amp with a real urban theme going on – a black and grey flecked vinyl cover with a silver grille and the distinctive GB logo tucked into the bottom corner. Hidden under these gritty aesthetics is a quality solid pine cabinet for superior resonance, while keeping the amp relatively lightweight. But it’s more than just a pretty face, with a lot going on under the hood. It is loaded with a single 12” Jensen C12K speaker, two 6L6 tubes and an all-tube preamp that features, among others, a single 12AT7. 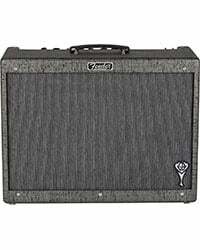 This all combines to deliver 40 watts of power, which should be enough headroom for most jazz players. This amp also comes with two switchable channels (clean and ‘drive/more drive’) as well as Fender’s renowned spring reverb. 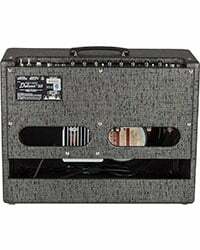 As for extras, this baby comes ready for the road with a two-button footswitch and a deluxe padded cover. What makes this such an excellent jazz amplifier is that it sounds phenomenal – George Benson doesn’t add his name to any old thing. This Hot Rod is perfect for jazz, as it offers the warmth and responsiveness of a tube amp, with more headroom before it distorts, allowing you to retain clarity while upping the levels. As you’d expect from a solid midrange Fender, it oozes a rich tone and as much character as George himself. Meanwhile, the reverb is awesome and plentiful. Overall, very solid in this department. This is not a cheap amp, but it feels well worthy of the price tag due to the look, sound and soul it offers. You may not have the same skill as George, but boy does this amp go a long way to helping you sound like him! For more info about the Fender George Benson Hot Rod Deluxe, click here.